This week's five AHAs are from the AHAbook™ Gutsy Leaders. 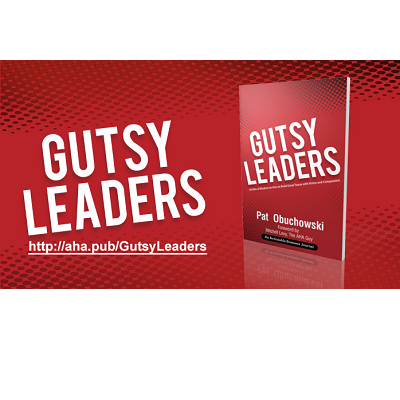 Please share this URL "aha.pub/GutsyLeaders" in your social media status update to let your friends know about it. The Kindle version of this book can be downloaded for FREE for the next 72 hours! Get your FREE copy here: https://www.amazon.com/Gutsy-Leaders-Wisdom-Vision-Compassion-ebook/dp/B079QMJMPS. In Gutsy Leaders: 140 Bits of Wisdom on How to Build Great Teams with Vision and Compassion, Pat Obuchowski (@Pat_Obuchowski), a credentialed and certified leadership development coach, shares her collection of insights into the world of successful, courageous, and gutsy leaders in the form of tweetable value-add tips. Pat helps leaders build strong and results-oriented teams by mastering their strengths, managing their weaknesses, and becoming skillful in coaching others. She helps people create plans that inspire them and then coaches them in the implementation of those plans. To see and learn how to automatically share AHAmessages from this book, you may check out this video: https://youtu.be/Q0RCBZKei3g. To learn how to automatically share via AHAblaster, please watch: https://youtu.be/bcnMEuzdY9U.